Please check out below Latest Job Vacancies, we will soon start publishing Dubai Jobs 2018. Furniture and lighting showroom in AL WASAL street. Wanted Indian guy know how to install lighting and have good English Language skills. Wanted Filipino salesman (INDOOR) for a retail shop based in SATWA. Age between 20 - 30 years. Required to communicate with customers for the selling of garments and footwear. Benefits: Visa and Health Insurance will be provided. Email: Call Below Number for Direct Interview. Our Reputable Company are hiring for Sales Executive, Indian, Filipino and Pakistani National only. Visit visa Holder can apply for this Job, we will try them for some time, if they can work, we will start processing Visa. 2. Good command in English. 3. Can work in minimal Supervision. 5. Responsible and Self Reliant. 8. People who have strong drive to learn. 9. People who have background & experience in Sales. Salary: Salary will be discussed upon interview. Benefits: Employment Visa will be provided. 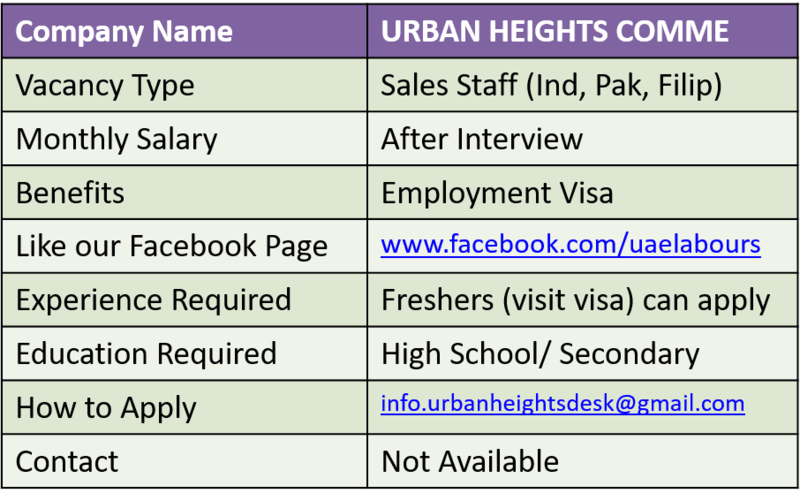 Contact: send Updated CV’s to above Email Address, shortlisted candidates will be called for face to face Interview. A company in UAE is looking for LADIES SALES Promoters for all Emirates. We are Hiring all across UAE (Dubai, Abu Dhabi, Sharjah, Fujairah, Ajman, Ras Al Khaimah etc). At least 2 years of experience in UAE market. Have great experience with groceries and hypermarkets. Driving license is a must (manual), can drive 3 ton truck. At least 5 years sales exposure in FMCG/ HORECA/ Retail segments in UAE market, Male/Female candidate, Graduate/ higher courses in retail management, good communication skills, Customer care, Product Knowledge, Market intelligence, Networking skills, Negotiation skills, ability to convince the customers etc. We only consider candidate with relevant experience in FMGC field with special preference to distribution sales to Hotels/ restaurants etc.